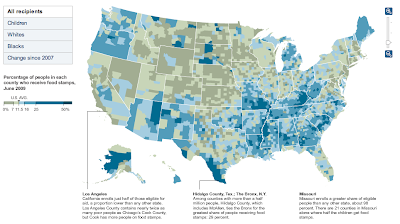 The Big Picture reports that Food Stamps at Record Highs in US. So there are more people dependent on food stamps than there are unemployed? Does that mean that some people work and yet can't afford food? Or are the actual unemployment rate much higher than the official 10 per cent? Could someone explain using plain english how one qualifies for receiving food stamps in the US? I suppose for foreigners like me it is hard to imagine the true picture. Plenty of working people can't afford food. The minimum wage is $7.25 - If you worked a standard 40 hour week that gives you $15,080 a year. But many businesses only offer 30 hour weeks. This results in people working two jobs to survive. You can survive on that but in no way can you be comfortable. Shelter, transportation and food will leave you almost no discretionary income. The government sets a poverty level for a single person at $10,830. To qualify for food stamps you basically need to have no more than $2,000 in cash or savings or equity in a vehicle and live at or below the poverty level. The exceptions are having children, being elderly or disabled and unable to work so that you are collecting Social Security Disability payments. It is very hard to qualify for that program. If you do qualify a single person is only given $200 a month maximum benefits. $200 doesn't go very far unless you are extremely careful where you shop and have good skills at cooking from basic ingredients and spend the time to do so. Then what about the surprisingly good US unemployment data that sent gold down by around $50? It said that unemployment fell slightly from October to November. Appearently the data was taken seriously as the dollar gained strength as well. Only reason for this "miracle" is announced next week�s $131 billion sale of US treasuries.